The dollar eventually crashed on the NFP in a week that was tense until this big event. More losses for the greenback? Speeches by Janet Yellen and Mario Draghi, Australian and New Zealand’s rate decisions stand out now. These are the market movers for this week. Janet Yellen speaks: Monday, 16:30. Federal Reserve Chair Janet Yellen will give a talk about the economic outlook and monetary policy in Philadelphia. Yellen may address the recent plunge in the US employment report and give clues about the Fed’s monetary policy intentions in the coming weeks. Market volatility is expected. Australian Rate decision: Tuesday, 4:30. The Reserve Bank of Australia cut its official cash rate by 25 basis points in May reaching a historic low of 1.75 %. This was the first change since May 2015, when rates were cut 25 basis points to 2%. The rate cut took the market by surprise. RBA Governor Glenn Stevens said weak inflation was the main reason for this move. Stevens also noted that global economic continued to grow at a slower pace than expected. Chinese trade balance: Wednesday, 2:00. The world’s second largest economy has been worrying markets for quite some time with lower economic activity. The bottom line figure of the trade balance report is less important than the changes in imports and exports. Higher levels on both figures is good news for the world and a more “risk on” atmosphere which is favorable for commodity currencies. And a drop in exports and imports is negative. US Crude Oil Inventories: Wednesday, 14:30. U.S. crude stocks fell last week by 1.4 million barrels. Economists expected a larger decline of 2.7 million barrels. The bullish report shows decline in domestic production, inventories not only of crude oil but also of gasoline and distillate and stock levels in the Gulf Coast. Crude oil prices edged up by about 60 cents after the release. NZ rate decision: Wednesday. 21:00. The Reserve Bank of New Zealand kept interest rates on hold in April, The decision was in line with market forecast. The bank stated that further policy easing may be required to ensure the pace of inflation reaches the middle of the target range. Global growth outlook remained a concern mainly due to weaker economic activity in China and other emerging markets. Domestic economy is reliant on strong inward migration construction activity, tourism and an accommodative policy. Inflation remains weak mostly due to low energy and import prices. Mario Draghi speaks: Thursday, 7:00. ECB President Mario Draghi will speak at the Brussels Economic Forum. After keeping rates unchanged in June, Draghi asked for patience saying the balance of economic risks has improved after the recent monetary policy measures taken. Market volatility is expected. US Unemployment Claims: Thursday, 12:30. The number of new US jobless claims declined slightly last week to 267,000, down 1000 from the previous week. The report posted the third weekly decline, indicating US employment market remains strong. Economists expected a higher reading of 270,000. The four-week moving average declined by 1,750 last week to 276,750. Next week’s report might be tilted byThe Memorial Day seasonal issues and the annual auto retooling shutdowns in late June/early July. Canadian employment data: Friday, 12:30. Canada shed 2,100 jobs in April despite a 35,000 gain in the service sector. A sharp decline occurred in the goods-producing industries offsetting the service’s sector gain. The unemployment rate remained unchanged at 7.1%. Economists expected a modest addition of 200 jobs after the strong growth in March. However, the manufacturing employment lost more than 50,000 jobs since December raising concerns. US Prelim UoM Consumer Sentiment: Friday, 14:00. Consumer confidence in the United States edged up in May to the highest level in nearly a year, rising to 95.8. Economists expected a modest rise to 89.9. The outlook index jumped by the most since 2006. Responders projected real incomes would rise by the most in 10 years. Current conditions also improved as many households reported their earnings had grown recently. This could suggest a shift toward spending turning away from savings. 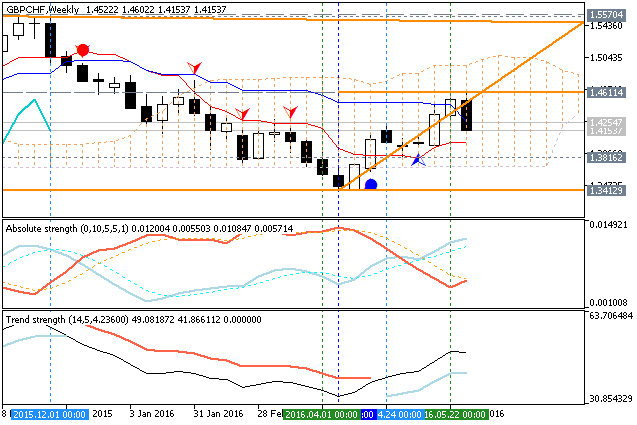 Daily price is on secondary correction within the primary bullish market condition: price was bounced from 1.4611 resistance level to below with 1.3816 possible target for the reversal of the price movement to the primary bearish market condition. If D1 price will break 1.3816 support level on close bar so the reversal of the price movement from the primary bullish to the primary bearish market condition will be started. 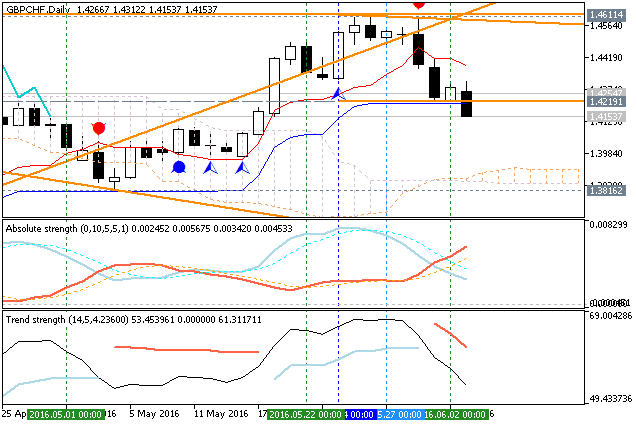 If D1 price will break 1.4611 resistance level on close bar so the bullish trend will be continuing without ranging. If not so the price will be on ranging within the levels. In the wake of the latest much weaker-than-expected US jobs report, the focus in the coming week would likely be on US Federal Reserve chair Janet Yellen´s speech on Monday. For some economists, May´s US non-farm payrolls report flagged the risk of that country possibly slipping into a so-called 'technical recession' in just over one year´s time. The dollar crashed on the NFP in a week that was tense until this big event. Speeches this week by Janet Yellen and Mario Draghi, Australian and New Zealand’s rate decisions stand out now. Against that backdrop, traders would also be waiting on a steady trickle of economic releases from the People´s Republic of China, including the latest foreign exchange reserves data (Monday), foreign trade numbers (on Wednesday), CPI and PPI (on Thursday) and figures on industrial production and investment in two Sundays´ time. A barrage of tier-one Japanese indicators on the country´s current account, foreign trade and gross domestic product - on Wednesday - might also help shape expectations for Tokyo´s next policy steps, especially those of the Bank of Japan. Significantly, both Australia and New Zealand´s central banks were set to announce their latest policy decisions on Tuesday and Wednesday, respectively. Data on industrial production were also set for release in the UK, France and Italy. On Monday Federal Reserve Chair Janet Yellen will give a talk about the economic outlook and monetary policy in Philadelphia. Yellen may address the recent plunge in the US employment report and give clues about the Fed’s monetary policy intentions in the coming weeks. Market volatility is expected. Tuesday’s big event is the Reserve Bank of Australia rate decision. The RBA cut its official cash rate by 25 basis points in May reaching a historic low of 1.75 %. This was the first change since May 2015, when rates were cut 25 basis points to 2%. The rate cut took the market by surprise. RBA Governor Glenn Stevens said weak inflation was the main reason for this move. Stevens also noted that global economic continued to grow at a slower pace than expected. Wednesday starts out with China, the world’s second largest economy has been worrying markets for quite some time with lower economic activity. The bottom line figure of the trade balance report is less important than the changes in imports and exports. Higher levels on both figures is good news for the world and a more “risk on” atmosphere which is favorable for commodity currencies. And a drop in exports and imports is negative. Following Tuesday RBA decision comes its cousin the RBNZ. The Reserve Bank of New Zealand kept interest rates on hold in April, the decision was in line with market forecast. The bank stated that further policy easing may be required to ensure the pace of inflation reaches the middle of the target range. Global growth outlook remained a concern mainly due to weaker economic activity in China and other emerging markets. Domestic economy is reliant on strong inward migration construction activity, tourism and an accommodative policy. Inflation remains weak mostly due to low energy and import prices. ECB President Mario Draghi will speak at the Brussels Economic Forum on Thursday. After keeping rates unchanged in June, Draghi asked for patience saying the balance of economic risks has improved after the recent monetary policy measures taken. Market volatility is expected. 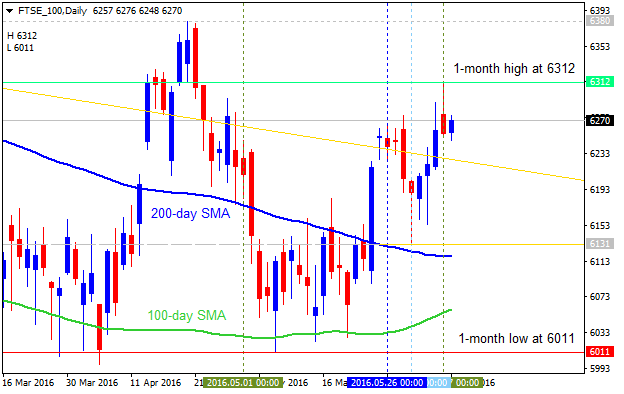 Daily price is located within 100 SMA/200 SMA ranging area: price is trying to break symmetric triangle pattern to above together with 200 SMA level for the reversal from the ranging bearish to the primary bullish market condition. If the price breaks 1-month high at 9295 so the reversal of the price movement from the ranging bearish to the primary bullish trend will be started. If price will break 8740 support so the primary bearish trend will be continuing with 8515 as the nearest bearish target. 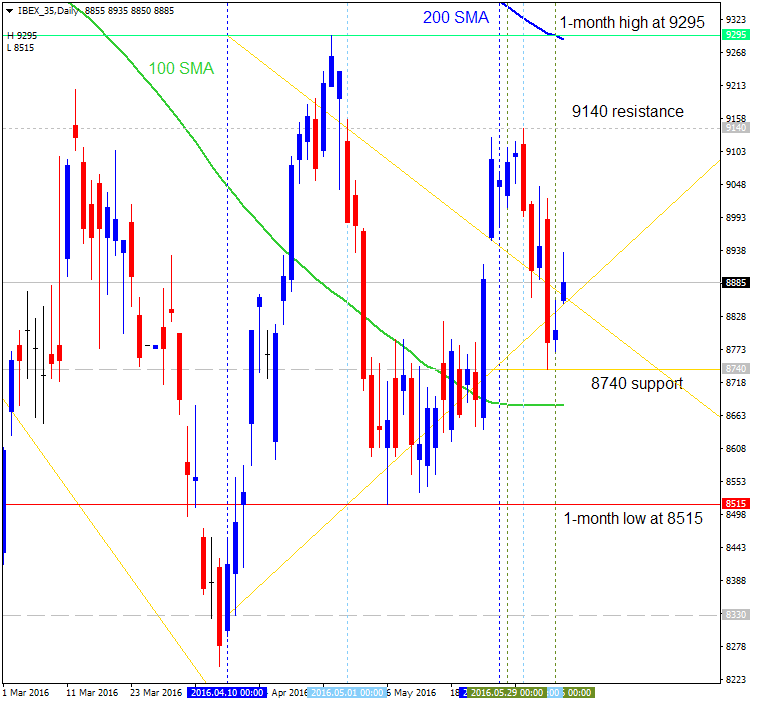 There is support between 6230 and 6200, with the 6/1 swing low at 6149 as the next level of significant support. As long as the spike day high (6323) keeps a lid on the market, we expect the market to be range-bound, with weakness unfolding in the very near-term. A range-bound UK stock market and currency as the next two weeks up to the EU referendum makes sense on this end as the pendulum swings from ‘stay’ to ‘leave’ within its own slight range at this time; its marginal between the two sides according to the polls, which aren’t necessarily all that reliable. No-one really knows at this juncture, and with that we are seeing that indecision in the marketplace.